In the early morning the brave rail-rangers gathered at the vehicle assembly building to perform another practice run with the rocket carrying rail. This time, we managed to load the rocket in the launch tower, for the first time since we arrived in Spain. 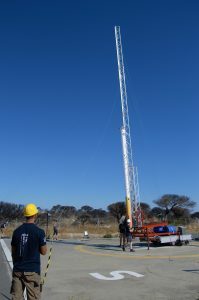 After loading Stratos III in the tower, the tower with rocket was erected, placing the rocket in its launch orientation. If you look closely at the picture you’ll notice the nosecone of the rocket is missing. It was removed temporarily as extra aluminum foil had to be added to increase radar visibility. Additionally, glow-in-the-dark bags were included in the nosecone, which get a fluorescent green color when in contact with water and UV light. This significantly increases our recovery chances in case recovery is late in the night, as it can get very dark in the Atlantic Ocean! Stratos III without nosecone in the launch tower. In parallel to the rocket carrying test, the electronics team left to Matalascañas to test the high gain antenna and helical antenna of the Stratos III ground station. This small village is located around 20 kilometers from the launch base. During this test, video and telemetry data were sent from the capsule, which was located at the El Arenosillo base, to the antenna at Matalascañas. We are proud to announce we received all data sent from the capsule successfully meaning there is a very high chance the live stream from the rocket on the launch day will also work as planned. 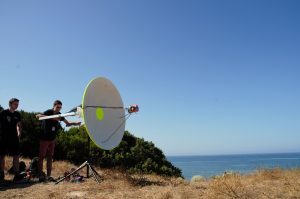 Electronics team aiming the high gain antenna to the launch base. Tomorrow we will do our first dress rehearsal together with the Spanish aerospace agency INTA. We will start early in the morning with a group picture and work our way through the procedures, bringing the launch of Stratos III again a step closer.